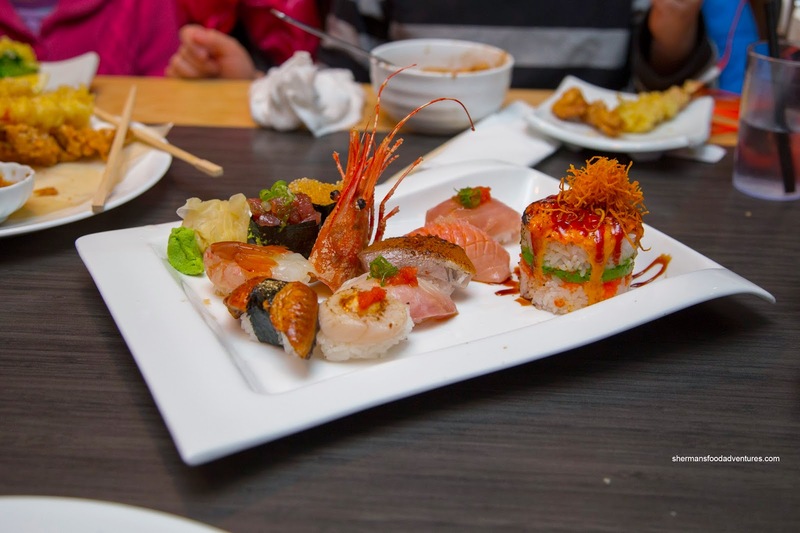 The last time we were dining on Japanese food in West Vancouver, we had a passable meal at Dundarave Sushi for a reasonable price. 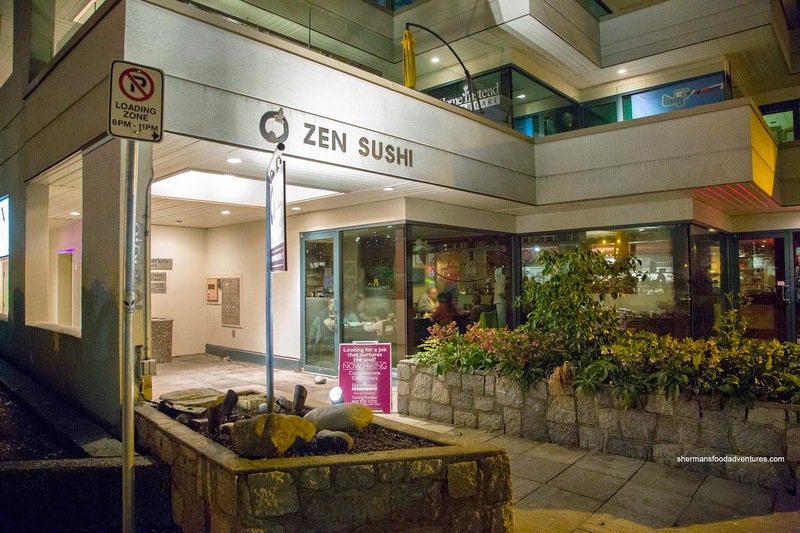 To change things up, we decided to go for something more pricey in Zen Sushi. To offset the cost somewhat, I once again visited the Groupon well. Yes, for some odd reason, I've been snapping up Groupons akin to a sale on crab at T&T. Hey, I figure that saving a bit of coin doesn't hurt if I'm spending the money anyways. So after a visit to CC Violin, we made our way down Marine Drive over to Zen for more food. 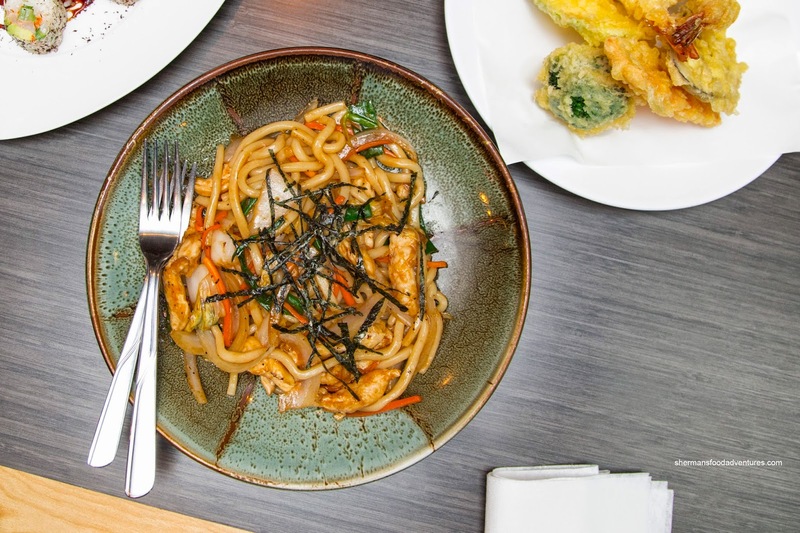 To start things off, we got the Chicken Yakiudon for the kiddies (well, mostly for my son because my daughter does eat sashimi and sushi). This appeared to be quite saucy, but in reality it wasn't overly wet. The flavours were mild with a touch of sweetness accented by an equal amount of saltiness. The noodles were nicely toothsome while the chicken was not too dry. This was an okay dish, but not something memorable. 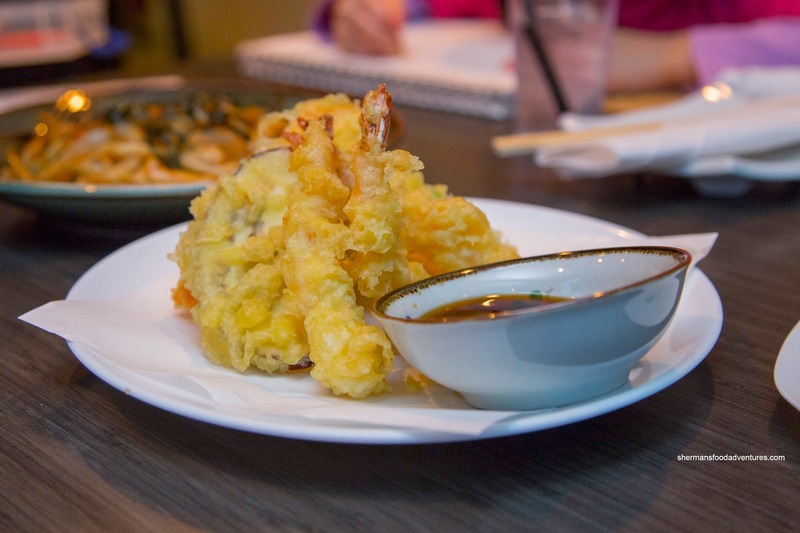 Next up, we had the Assorted Tempura which sported a fairly thick layer of batter. At first, it was somewhat crispy, but as it sat longer, it became soggy and doughy. We found the ebi to be rather meaty and a touch overcooked. 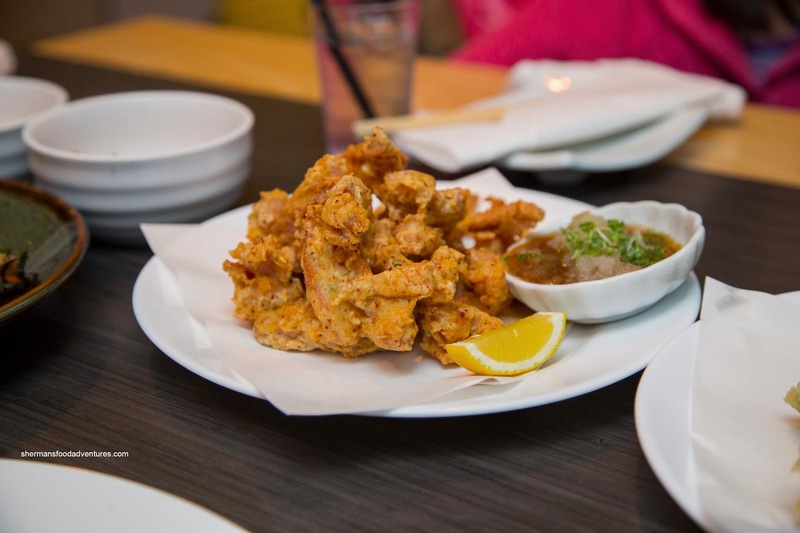 Arriving piled high, the Chicken Karaage was essentially a collection of small fried chicken tenders. The batter was really thin which meant there was not much of a crunch. Rather, it was mostly pieces of fairly moist white meat that was adequately seasoned. I would've preferred something a bit more robust, but the kids liked the dish, so what do I know? Moving away from the cooked items, we had the Speckled Scallop Roll wrapped in soy paper with scallops, avocado and asparagus with purple shiso dust. 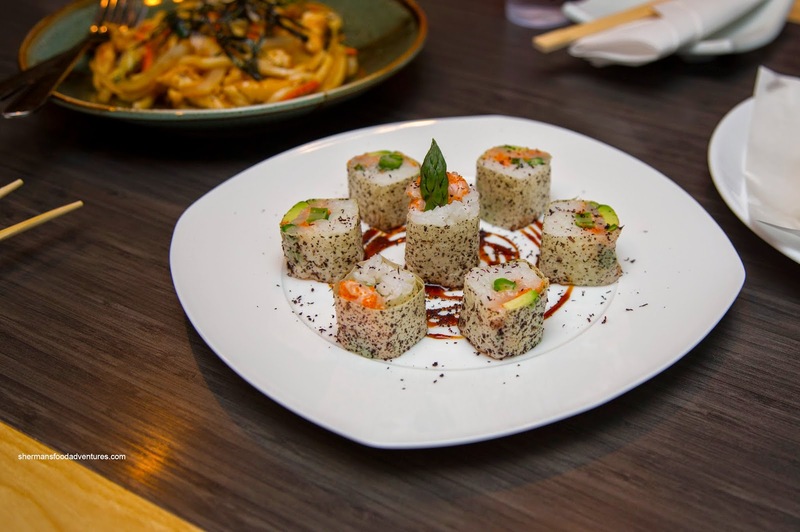 We enjoyed this roll due to its simplicity and quality ingredients. The buttery soft and sweet scallops were wrapped with just enough rice. The sushi rice was a touch soft, but still plenty chewy with a mild sweetness. 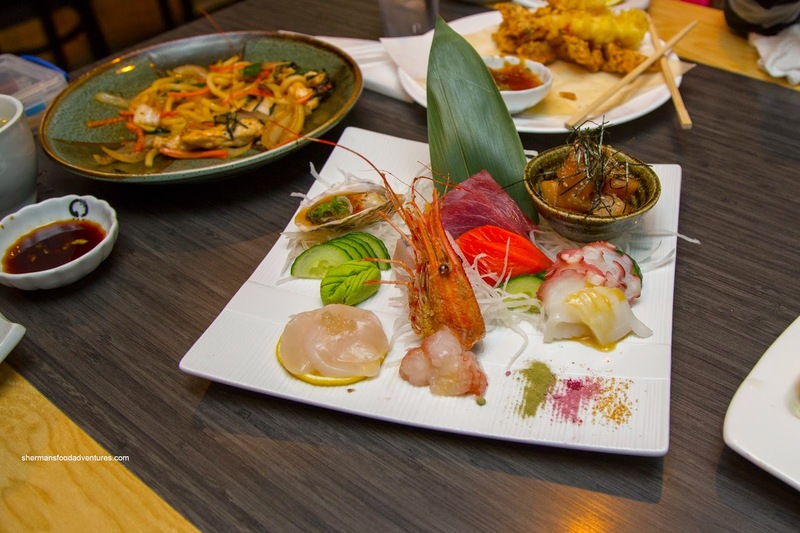 Now onto the good stuff, we had the Chef's Selection Sashimi consisting of an oyster, hotate, ebi, ika, tako, red tuna, sockeye salmon, hamachi, tuna gomaae and fried shrimp head. Everything was on point in terms of texture, appearance and taste. What really stood out was the buttery hotate and ebi as well as the equally buttery and sweet hamachi. Yes, this cost $30.00, but I wouldn't hesitate to say it was worth every penny. Next up, we had the Chef's Selection Sushi that included a torched salmon sushi tower and 9 pieces of nigiri (unagi, hotate, ebi, flounder, aburi hamachi, aburi salmon, tuna, tuna poke and tobiko. Again, the ingredients were fresh (as flash-frozen can get) with appealing textures and taste. As impressive as the salmon tower appeared, we thought it was rice heavy and oversauced. However, the last 2 dishes in general were well-executed and enjoyable to eat. With that being said, we were indifferent with the cooked items as they were pretty ordinary, especially for the price. Overall, Zen was a pretty expensive experience even with the coupons. If we ever return, we would stick with the sushi and sashimi exclusively.